Wrap back V-neck slip dress and camisole. 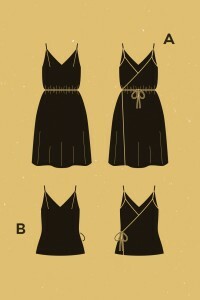 Version A dress is cinched at the waist with a belt, version B camisole is loose-fitting and tied at the side. Recommended fabrics: rayon, lyocell, cupro, silk crepe, silk charmeuse, cotton crepe. Allow extra fabric to match stripes or plaids. Fabric used for version A: Rayon Crepe - Eglantine et Zoé. Fabric used for version B: Rayon Crepe - Eglantine et Zoé. Diane's measurements: 5'4" - 36¼"/29⅛"/42½"